Bromeliads, native to North and South America, are a special class of plant known as epiphytes. Epiphyte is a fancy name for plants that grow on another tree or plant without harming their host as a parasite would. Bromeliads also grow on rocks and in the soil of the forest floor. Indoors, these plants grow in potting soil and garner admiration for their big, colorful leaves. These leaves come in a variety of colors and may be plain, variegated or striped. The only thing more beautiful than the leaves of these plants are their flowers. Bromeliad blossoms are big, bold and absolutely dazzling. Unfortunately, bromeliads bloom only once. After that, you can continue to admire the plant for its foliage but won't see another flower. You can, however, encourage the plant's pups to bloom. Once your bromeliad gives you a flower, it won't do so again. It will instead slowly die over the next year or two. All you can do is continue to care for the plant in a way that encourages healthy foliage and the production of new plants, called pups. To do so, begin by removing the spent flower from the plant. Cut the dead flower from the bromeliad using a pair of pruning shears or a sharp knife. Whatever tool you choose, wipe it with alcohol to sanitize it before cutting into your plant. Clean the plant's leaves with a soft, damp cloth and place the bromeliad in filtered or diffused light. Near a bright window covered with a sheer curtain is the perfect spot. If the plant begins to turn yellow or pale green, it's probably getting too much light. If the foliage turns dark green and droopy, the bromeliad may need more light. 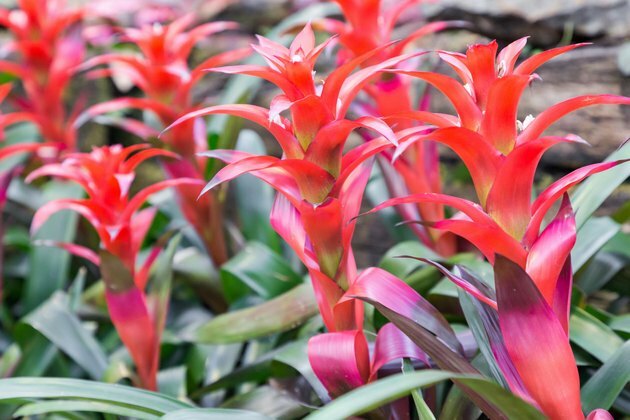 Water your bromeliad once every one to two weeks by pouring lukewarm water directly into the cup of the plant. Feed your bromeliad every three to four weeks. Use a regular liquid fertilizer for indoor plants, but dilute the fertilizer to half strength. Pour the fertilizer solution directly into the bromeliad's cup. Remove the smaller pups growing from the base of the plant when they reach approximately half the size of the mother plant. Cut the pups from the mother plant with a sharp, clean knife. Dig under the soil a bit and make your cut at the base of the pup where it splits from the mother plant, cutting as close to the parent plant as you can without causing damage. Plant the pup in a four-inch container filled with a loose potting soil that drains well. Commercial potting soil designed for cacti and succulents works best. You may have to tie the young bromeliad to a wooden stake to keep it upright until it forms a strong enough root system to support itself. Water the young plant as needed to keep the soil moist but not soggy and provide ample filtered light. When your young bromeliad's leaves form a cup, keep the cup filled with water rather than watering the soil. You can begin your normal fertilization routine immediately after transplanting the pup. Give your new plant at least a year to establish itself before forcing flowers. Bromeliads can take anywhere from one to three years to reach maturity and flower. If yours is at least one year old, you can often force the issue by using a natural chemical called ethylene gas to create a blossom. This is often done in nurseries and is easy to do at home. To do so, pour out any water from the cup of the plant. Place a ripe apple or two in the plant's pot and cover the plant with a clear plastic bag. Seal the bag tightly with a rubber band and then place the plant in an area full of diffused natural light as you normally would. As they decay, the ripe apples will produce ethylene gas, encouraging your plant to bloom. Remove the bromeliad from the plastic bag after seven to 10 days and fill the cup with water. A bloom should begin to emerge anytime from six weeks to four months later. If it doesn't, you can get some more apples and repeat the process. Bromeliads like to work at their own pace, so you'll need lots of patience to coax blooms from some plants. What Is the Lifespan of an Orchid?